Yesterday afternoon I received a phonecall from Steff, in the Gwent Urology Unit, offering me the chance of bringing forward my appointment, due on 23-Mar-2017, for my TURP (Trans Urethral Resection of the Prostate) to tomorrow morning! Steff suggested that I came into the Urology Day Unit by 10am, having nothing to eat or drink after midnight, so that I could be ready for anaesthetic in the morning if there was any delay or drop out by another patient – meanwhile assuring me that Adam Carter (my consultant urology surgeon) and the consultant anaethetist he had wanted for my op. would deffinitely have an alocated time for me in the afternoon if there was no morning cancellation. As it turned out my op. was done just before lunch using an epidural anaesthetic – that is the one administered by an injection into the lower back, the downside of this form of anaesthetic, which deadens the nerves roughly below the point of the injection, is that it can, when the patient is taking anti-coagulants as I am, that if ANY mistake is made it can lead to bleeding into the spinal column which in turn CAN lead to long term paralysis! The advantage, on the other hand is that it does not lead to unconciousness, as with a GA (General Anaesthetic) thus not only does it not leave anaesthetic in the system for a prolongued period after the operation, but it also meant, which I have alwaqys favoured, that I would be fully conscious and able to watch the operation being done on the screen. Watching the surgeon slice away your own prostate from inside the bladder, whilst chatting about what he is doing, is a VERY strange experience! The operation went well and just over an hour after the injection in the spine it was finished and after Adam had shown me the glass jar containing all the little bits he had cut away, which was quite a lot, I was transfered from the operating table onto the trolley and wheeled off to recovery where it took quite a while to get my temperature back up! During the operation there is a constant flow of saline from the stand via the tube, into the bladder and out, sluicing the debris and clearing the blood so that the surgeon can see exactly what he is doing. During the operation I counted around 19 x 2L square plastic bottles of fluid so around 40Ls of relatively cold fluid, which drops the body temperature during the hour of the operation. Then with a guage 22 three way catheter in place it was off to Ward D5East for a couple of days until the bleeding had slowed down a bit! Eventually, although I was still bleeding quite heavily and still had a 3 way catheter in, Adam Carter responded to my pleas to go home, where I could recover in greater comfort and with much better food! 3 days later the bleeding had reduced dramatically and I went back into the Gwent where despite no allocated ‘slot’ Steff fitted me in between other patients and and removed my catheter so that I could be TWOCed (Trial With Out Catheter), which once I had proved I could safely pass urine I was able to go home. That is not to say that the bleeding has stopped! Minded that the operation was on the 8th. and it is now the 31st. there is still a small amount of bleeding – I guess mowing the lawn today didn’t help! That said there seems no doubt that the operation would seem to have been a great success and at least I am not having to get up 3, 4 or 5 times a night to go to the toilet, which was the outcome of having a greatly enlarged prostate! The other great result of the operation was a letter from Adam Carter, the day before yesterday, to tell me that all the tissue he removed from my prostate (the jar!) 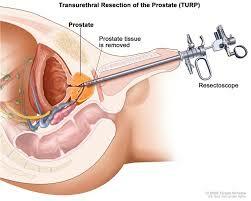 had been biopsied and had been found to be perfectly normal prostate tissue free of any signs or traces of cancer. A very reassuring outcome – I can recommend this operation to anyone with Benign prostate enlargement (BPE), also known as benign prostatic hyperplasia (BPH), a condition that affects older men (yep that’s me at 71!). Several friends of mine have had the op. with great outcomes and at the moment a friend of mine in his mid 50s is in The Royal Gloucester hospital with an enlarged prostate, which has inhibitted voiding of the bladder that has led to a severe UTI (Urinary Tract Infection), which in turn led to blocking of the urethra last Sunday night, leading to a blue lit ride in an ambulance, in extreme pain, in the early hours of Monday and now in the early hours of Saturday they finally removed his catheter but are still battling to control the infection and get his temperature down! I expect that a TURP is very much on the cards for him, once the infection is cleared and his regular urologist can get him a bed in the Royal Gwent for the operation. In my case – thanks to Adam Carter, Steff and the rest of the team who looked after me in the Gwent. This entry was posted in Prostate, TURP and tagged BPE, BPH, GL-W, Greg Lance - Watkins, Greg_L-W, Pre-Op., TURP. Bookmark the permalink. ← 23-Feb-2017 – 10:30hrs. Royal Gwent Urology Dept. Day Unit for A TURP op.